It is fitting that the end of the human race (even if it’s just in fiction, for the moment) should be brought about by its desperate need to save itself. In Rise of the Planet of the Apes, in case you’ve forgotten, saw James Franco, in the attempt to halt his father’s Alzheimer’s, invent a virus that made primates super smart. And, in a quiet side plot, kill humans within days. Ten years after the showdown on the Golden Gate Bridge, the apes of San Francisco have developed into a functioning society, complete with schools and doctors, and led by their revolutionary leader, Caesar (Andy Serkis). Caesar is a family man now, he has a son approaching adulthood, and a brand new baby. It’s been years since the apes have seen humans. They believe that everyone has died. Until one day, a small group arrives in their midst. Led by Malcolm (Jason Clarke) they’re looking to restart an old dam and get power running to the city, so they can try to contact other survivors. While Malcolm and Caesar try to cooperate, things quickly move beyond their control. Caesar’s advisor, the rage-filled Koba (Toby Kebbell) was tormented for years in labs, and believes humans inherently evil, while Malcolm’s friend Dreyfus (Gary Oldman), a former soldier cannot be convinced that the apes are capable of rational thought. Both are preparing for war. As we found with (and it may not be a good idea to mention this) Phantom Menace et al., doomsday prequels are difficult to handle. It’s hard to invest in a story when you know the ultimate ending, and when you know that it doesn’t end well. Rise’s strength was in Caesar’s story, and in his relationship with his human family. It was in his development from and innocent and curious child, to a passionate revolutionary. Dawn carries this on and expands it. The story is one part the disillusionment of a leader striving for peace, and one part the tragic irony of two cultures descending to an inevitable conflict that could have been avoided, if only they understood each other. That we have some idea what’s coming is all to the good; the tension from the ultimate show down bleeds backwards, simmering in two pots of menace moving ever closer. And thanks to the team at Weta, the menace feels very real. 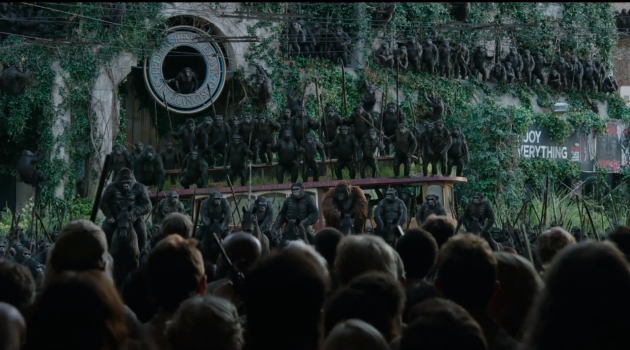 The apes, even en masse, always feel like richly drawn individuals. In fact, they are more compelling characters than their human counterparts. Dawn is packed with action, with danger, and with truly compelling characters. And all of this is layered over a finely nuanced look at two sides of conflict. All its characters have a voice, and while we may not approve of them all, we understand them. The tormented and brutal Koba, the fierce and determined Dreyfus, everyone. Rather than ask its audience to pick sides, it shows them the truth of both sides, and that is its tragedy and its power. It’s a gripping new instalment in the Planet of the Apes franchise, and one of the most thought provoking blockbusters of the year. First movie I’ve had a chance to see at the movies in months. Don’t know if it was the novelty of the big screen after so long, but I loved it! Worth seeing for the incredible digital effects of the apes themselves.